So cute! I definitely need to add one of those jackets to my wardrobe for this spring! Have a great weekend! Such a cute spring look, I’m pretty sure I will recreate it at some point. It seems Florida has decided to go from a few weeks of Winter straight into Summer! Ugh, normally I love to pull out my utility jacket but lately it’s been too warm. This is making me wish we’d have at least a few more cold snaps! Yuck! I love summer, but I do prefer a gradual warming up period so I can wear cute layered outfits like this one. Haha! Love this outfit so much! Perfect for the transitional season. Thanks for hosting! We are just the opposite of Kellyann…we just got more snow last night, so I’m still pulling out the winter coats. It’s so hard when everyone else is talking spring, and I know we have at least 2 more months where snow will be part of the forecast!! Ugh. That’s way worse, in my opinion!!! It’s certainly possible to get snow here in March, but it’s not typical. We’re definitely in-between the weather extremes, which is pretty convenient for a fashion blogger. Still, I could happily do without the month of March. Haha! Loving this combo! Definitely a great jacket. I especially like the softness of the color, very springy. Perfect spring look! I am loving that utility jacket! I need to take more risks with putting various colors and patterns together! It’s not easy stepping out of our comfort zone, but it can be invigorating. I have an olive green utility jacket that will be perfec5 for me to wear now, since I am hot natured, so I need to put it to good use. Through tomorrow we will continue with spring like temps, then the rain & thunder, followed by highs in the 60’s returns. Yay! Have a fabulous Friday! Hi Jo-Lynne, I’m in the market for a good pair of white skinnies and might order the Articles of Society Sarah you’re featuring. My problem with so many light colored jeans is they show every lump and bump. Do you find these skinnies are thick enough to camouflage imperfections? Are they true to size and do they bag out? I hear ya. I feel like these are better than most at not showing all the lumps and bumps. They do stretch out some, though. They run TTS. If in doubt, size down. THey’re worth a try! With free returns, you don’t have anything to lose. I would say to wear them for an hour or two before taking off tags, just to be sure they don’t bag out too much for you. Thanks for your feedback. I just ordered them through your Blog site! Be Blessed! Please let me know how they work for you! Great look in all neutral colors. So chic. So envious of your nice weather. It is not spring like here at all. Very unusual weather for the Pacific Northwest. That utility jacket is cute and quite different in it’s relaxed fit. I love jackets but already too hot here for them. 🙁 I’m going to CVS today & get that Olay whip moisterizer. Love these looks and I agree about these jackets. Your sunglasses are so amazing! Happy Friday! What size do you have in the utility jacket? I’m 5’3″ about 128lbs. and wondering if it would be too boxy and wide for me and my height? Is the grey color true to the sight? I’d like a lighter grey, so wondering if you saw the grey in the store? I have the small. I would say it runs big, you probably want an XS. I love a good utility jacket—it’s such a great layering piece! Yours is super cute too! Jo-Lynne, this is a great jacket. So versatile and perfect for Spring. 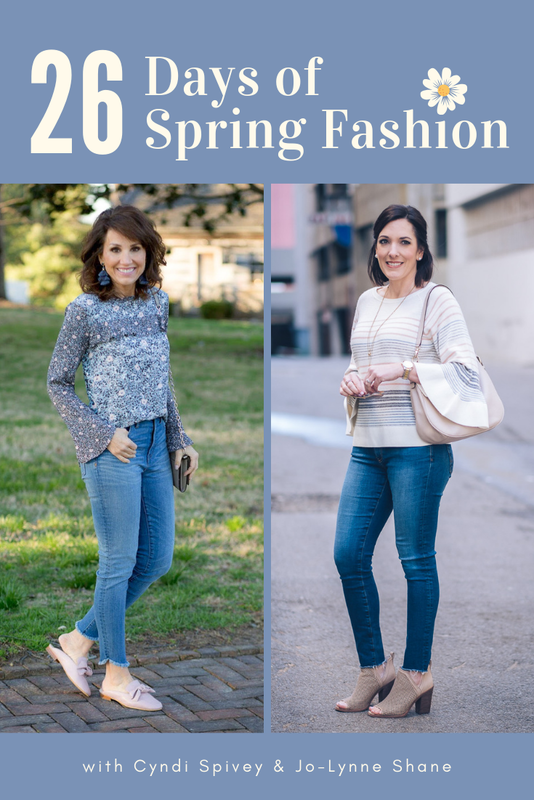 I don’t recollect you wearing boyfriend jeans often on the blog, but oh my, they are so adorable on you! You’re right, I don’t wear them much. I feel like they add visual weight, but they’re fun for a change. Hey Debbie, I checked and you are subscribed. I recommend checking your spam folder. Hope you find them there! If it keeps happening, you can set up a gmail filter to never mark my email address as spam. The email the newsletter comes from is [email protected].